You have heard it said many times, “The kitchen is the heart of the home.” It is the room where all crowds congregate, where all meals are prepared, and where all late-night snacks are snuck. It is the place in our home where most of our great life memories are conceived. You deserve to have a kitchen that meets the needs of your family and reflects your own unique and personal style. 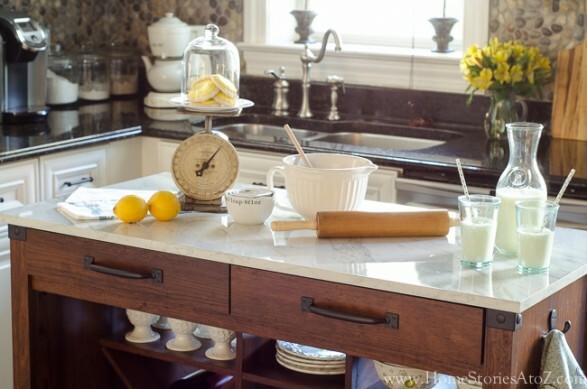 Let’s explore 3 ways to personalize your kitchen. 1. 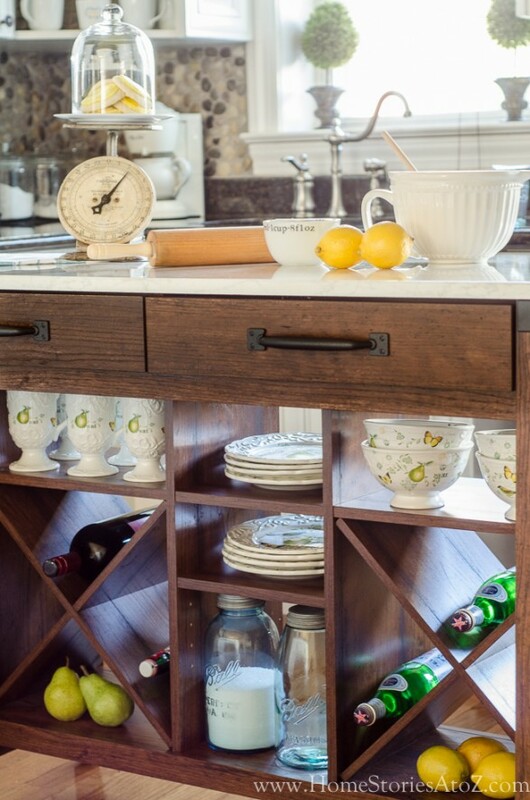 Add storage and personality with a kitchen island or kitchen cart. The island is often the main focal point of the kitchen and provides an opportunity to show off your style. 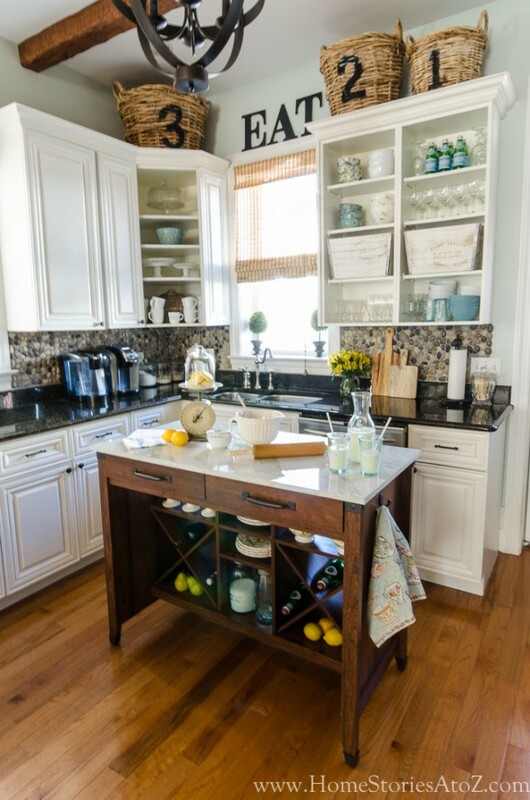 Whether your kitchen is small or spacious, a kitchen island or cart is a great way to add another layer of interest to the room. 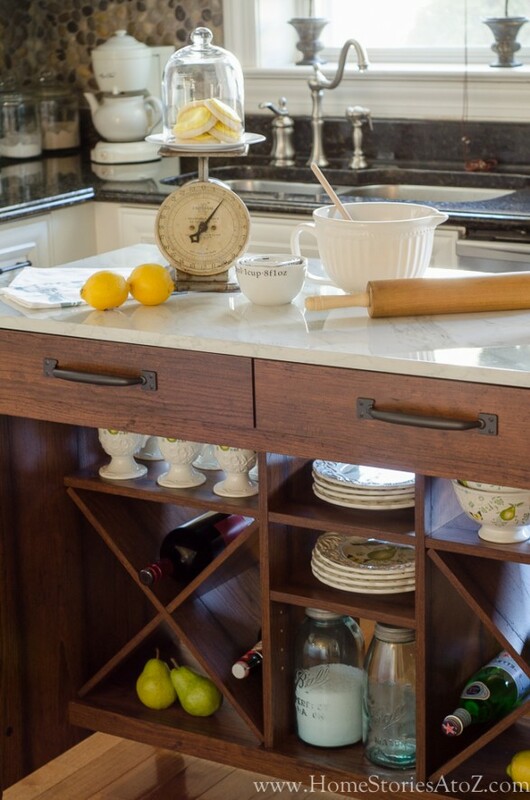 In my kitchen, the addition of Sauder furniture’s Carson Forge Gourmet Stand enhances the farmhouse feel. The white faux-marble top works beautifully with the white cabinets, while the rustic-wood finish blends nicely with the wood beams. 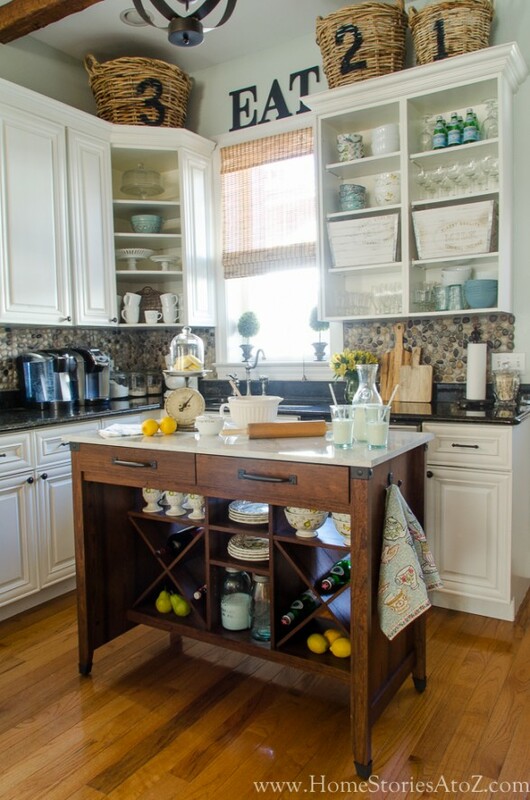 When choosing an island or kitchen cart, it’s okay to choose something in a different finish or style–but look for one that connects the different elements in your kitchen with a common thread. 2. Choose a unified color palette that can easily be changed. Personalizing your space is a dynamic process. I like to update the look of my kitchen several times a year depending on the season or holiday. To do this, I simply choose a unified color palette in my dishware and kitchen accessories. In the fall, I might incorporate all black and white, at Christmastime it might be red, white and green, and in the springtime it might be green, blue, and yellow. Adding pops of color through produce and colored-glass bottles is an inexpensive, yet effective way of brightening your kitchen. I often store our produce in the refrigerator drawer, but it looks so much more appealing–and often gets eaten more quickly–when put on display. Remember that you can actually accessorize with your groceries, so don’t always put everything away! Experiment with adding pops of color with items you already have on hand. 3. Personalize your kitchen with things you love. 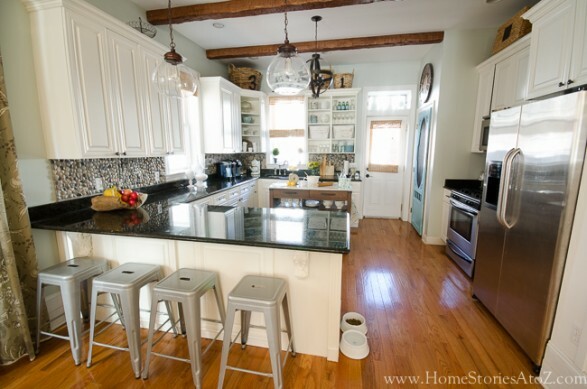 I love river rock, wood beams, open shelving, seagrass, white cabinets, marble countertops, and blue mason jars. You will find all of these things in my kitchen and yet none of them were there in the beginning. All of these elements have been added to my kitchen slowly over time. 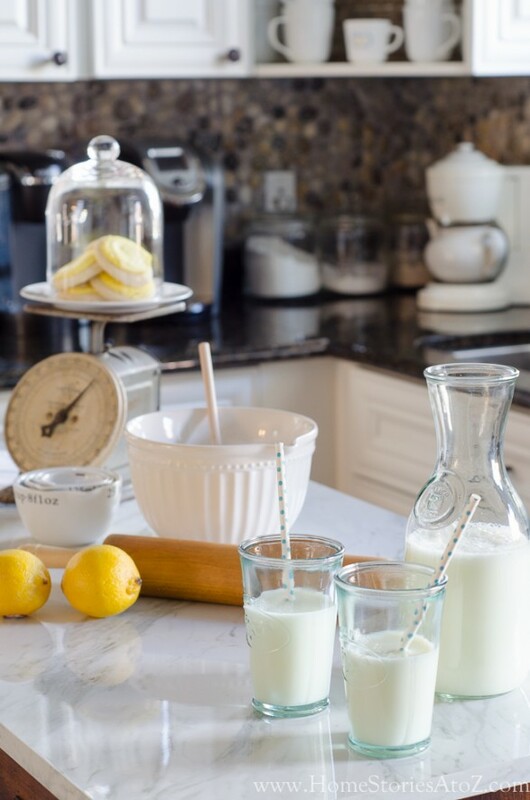 While major kitchen design changes might take a considerable amount of time to procure–as resources and budget allow—personalizing your kitchen through accessories you love is always within reach! 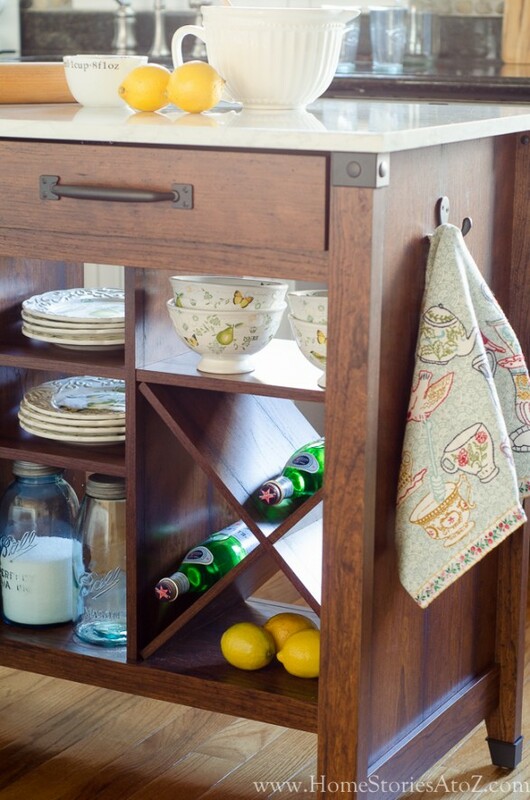 Pull out that dishware pattern you have hidden in your hutch and allow it to be displayed. 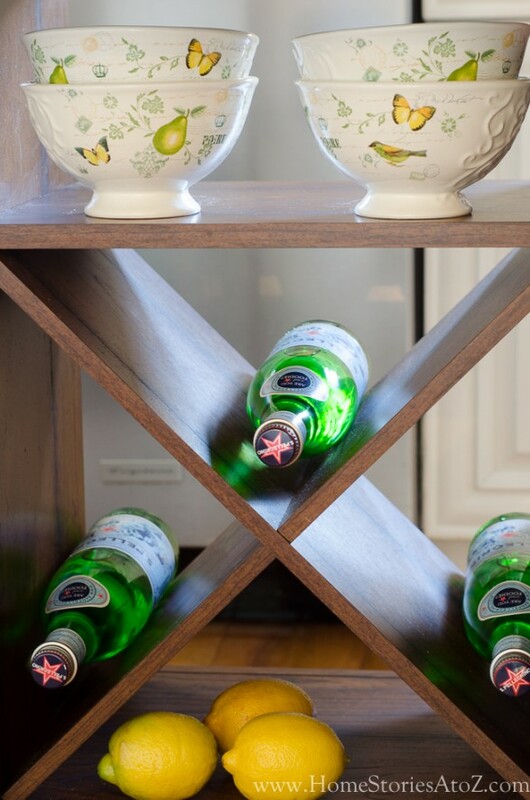 Fill your wine rack with wine, Pelligrino, or pretty Italian sodas. Even something as simple as a new dishtowel can work wonders in adding some personality to the kitchen! I have a bit of a dishtowel obsession and love the instant color and charm they add. Looking for more inspiration? If you are in need of affordable furniture that can help you create, enhance, and complete your own unique style, I recommend checking out the furniture at Sauder. Take a look at their Style Lab and see whether or not Cottage Coastal, Urban Classic, Vintage Eclectic, or Modern Simplicity appeals the most to you. I really liked pieces from both Cottage Coastal and Urban Classic. My kitchen island featured in this post is part of the Urban Classic style, and I am completely in love with it! 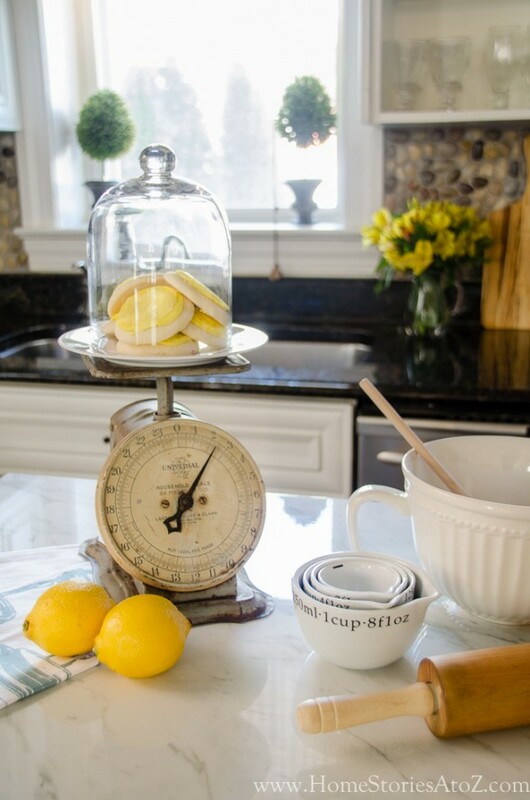 So how do you go about personalizing your kitchen? Do you have any tips to add? I’d love to hear them in the comments below! The kitchen is a place to bond over meals, cooking, and conversation. Your post shows that it is not hard to personalize your kitchen, so it expresses your family’s style. Love your kitchen, the island in particular! I just want to recommend something a lot of folks forget about in the kitchen – art! Little pieces of colorful art can make a huge impact. Pictures from calendars or magazines, postcards, pretty greeting cards, children’s art. Frame them inexpensively and hang them or prop them in your kitchen and it’s a truly personal touch! Here’s to personalizing every room in your home! I like the idea of unified color palette that can easily be changed. You can paint it in different colour every year. Great! 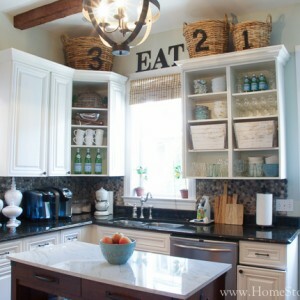 Personalize your kitchen and make it your own by doing what someone else tells you to do with it? LOL. I love all of your tips! We love a lot of the same things in our kitchens. I LOVE tip #2! So smart. And I love the baskets on top of your cabinets. For whatever reason, I never know what to put up there! You have a beautiful kitchen! Your kitchen is just lovely! 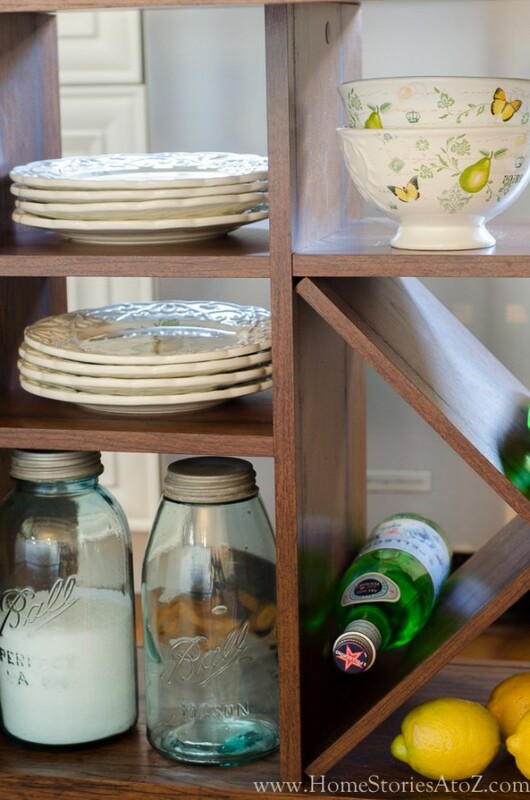 I love how you added pops of color with the lemons and bottles, that is my biggest problem. Love my neutrals! But I may try this, thanks for the tips! I love the look of neutrals too! Neutrals are gorgeous and sometimes just something green makes a big difference. Thanks for visiting me Ashley!